ICEZEIT - Management Services - ICEZEIT The coolest place in town. Based on its decades of experience, ICEZEIT INTERNATIONAL can offer its franchisees a wide range of services. Income statements are the basis of every business plan and an important basis for the decision to open a franchise business. Only well-researched data can guarantee a solid basis for a business plan. Country-specific characteristics and unforeseen or unequal parameters make forecasting difficult and can never be foreseen one hundred percent! ICEZEIT INTERNATIONAL can provide values and tables about comparable countries and their success calculations below. However, as mentioned above, these must always be taken with special care and require a thorough check by the franchisee and their local advisor as to whether they can be read over to the respective country. Note: The visible plan is only a non valid sample! ICEZEIT INTERNATIONAL can provide various applications if required and against reimbursement of costs. on the other hand, to simplify the ordering process for customers. 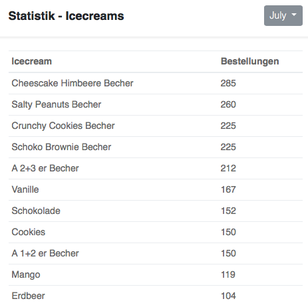 After clicking on New order with stock level, the stock level will be highlighted in blue and you can add ice cream or other products as desired. Once you have clicked on all products in the desired quantity, you can proceed to the delivery time by clicking on Continue. Just click on the desired date. The franchisee can check and process the orders of his B2B customers or his own branches in a web application at any time. After ordering a customer, the franchisee receives an e-mail with a pdf of the order and can immediately view, manage and process it in his application..
All incoming orders of own branches or B2B customers are visible in a dashboard and can also be managed there immediately. Statistics can also be called up here, or each customer can be called up individually. In addition, products are created or blocked and minimum delivery quantities are entered here. APP for warehousing and ordering franchisees. 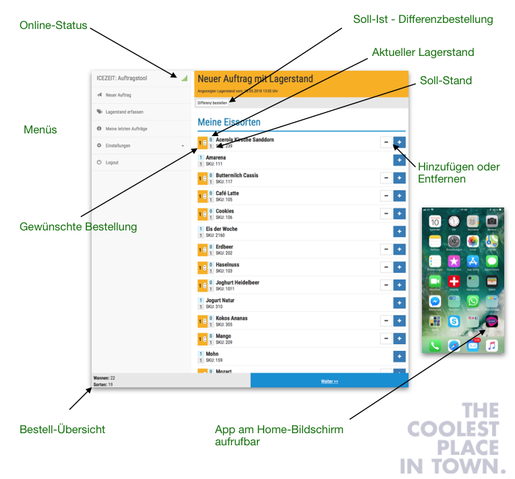 ICEZEIT INTERNATIONAL has developed its own app for its own ordering system - especially the goods that the franchisee needs for its production. Based on the required or planned quantities of ingredients based on the recipes, the app separates products to be ordered locally from products to be ordered internationally. The current stock level can be integrated or recorded in this ordering app. All recipes, ingredients and mixing ratios are stored in the app and can be called up at any time. ICEZEIT INTERNATIONAL GMBH does the rest. Nutritional values and mixing ratios of the various types of ice cream can be called up at any time and are clearly displayed. All ingredients, allergens and specifications are always available. Pictograms clarify the specifications and thus ensure that, for example, all allergens are always clearly visible to the franchisee. By means of separately available tool one can call up online finances, waiter reports, racers and bums and the like, in order to always have his branches in view. 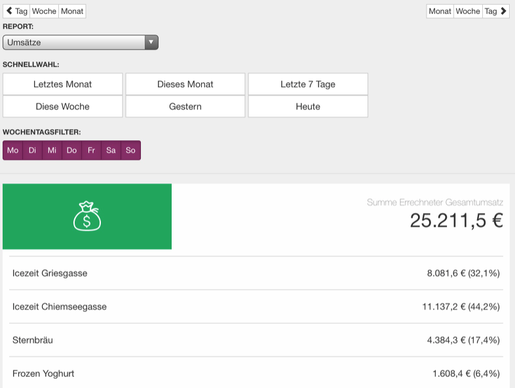 SM Order is an application that works with various POS systems and can be ordered separately. Smorder can be ordered independently of ICEZEIT INTERNATIONAL. Due to the long experience in the management of own companies (production, branches and B2B business) as well as long-standing franchise partners in different countries, there is a lot of comparative data which can help the franchisee with his calculations. Employees are the soul of every company. Their manpower and know-how, together with the transferred responsibilities, are an important asset. The more important employees are, the worse it is when long-serving employees leave the company and leave a gap that is difficult to close. ICEZEIT INTERNATIONAL has standardized all work processes in such a way that anyone without relevant professional experience can produce high-quality ice cream in an extremely short time. This significantly reduces the pressure on the employer and there is no need to employ employees with previous knowledge. This is an essential point of the standardization measures of ICEZEIT INTERNATIONAL GMBH. Internal communication can take place via different channels. Recipes, ordering processes, delivery etc. 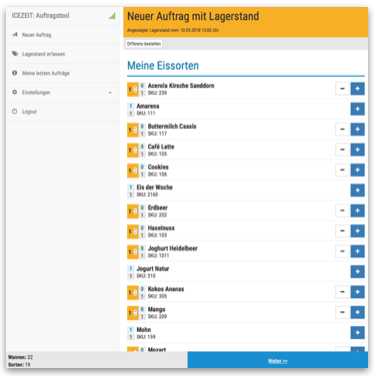 are carried out via the ICEZEIT App. The rest can be done via e-mail or Whats app.